Barbells and dumbbells are the favorite strength and muscle building tools among fitness trainees, athletes, bodybuilders and, of course, competitive weightlifters. Bodyweight exercises, kettlebells, resistance bands, and weight training machines are used to build strength and fitness, too. And each has its merits. Thorough muscle building workouts are possible with only a standard set of weights. 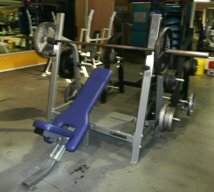 A standard set consists of a steel bar that is five to seven feet long, and two shorter bars (for dumbbells), and cast iron plates. The plates slide onto the outer portions of the bars and are secured by collars to prevent them from sliding off during exercise. An Olympic bar is made of steel, is seven feet long, and weighs 45 lbs. 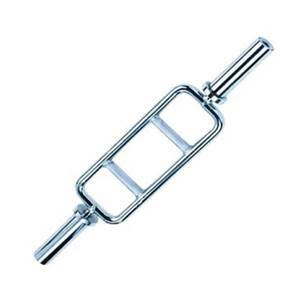 The bar has rotating outer ends to prevent it from twisting a lifter's arms and wrists. The plates are color coded according to weight. Competition plates are milled to strict tolerances, and are calibrated to spin evenly on the bar. The larger plates are also constructed with rubber bumper edges, making them safe to drop. Standard collars can be of any material, usually steel, and weigh 2.5 kg each. Weightlifting competition plates are colored coded as follows . . . 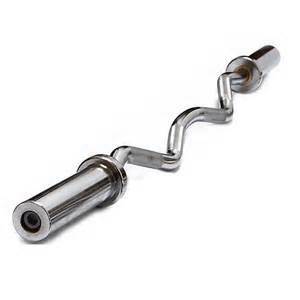 The EZ curl bar is a variant of a bar that is often used for bicep curls, upright rows, and lying triceps extensions. Its zigzag grips allow the user's wrists and forearms to take a more neutral position. Some trainers believe the curl bar is more efficient to build upper-arm and forearm muscles than the traditional straight bar. It is often used by lifters who experience wrist pain caused by the extreme supination of the forearm using a straight barbell. Extra-thick long bars are used for developing a strong grip and also in strongman competitions for deadlifting and overhear presses. Triceps/biceps specialty bars have two vertical handles mounted in a cage in the center of a short, straight bar. You hold the weight by the vertical bars to do triceps extensions and hammer curls. 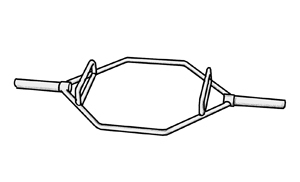 Trap bars: These excellent bars have a diamond shaped cage in the middle of a long bar. You lift by standing inside the cage while holding bar handles in a neutral grip. This centers you while doing shrugs or deadlifts.